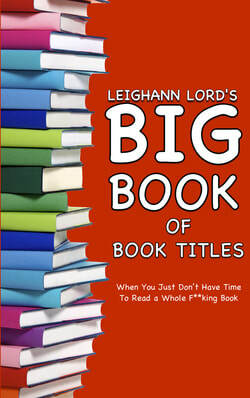 Leighann Lord's Big Book of Book Titles: When You Don't Have Time to Read a Whole F**king Book - There’s a reason why you don’t have the time to read a whole f**king book. Since 2000, the average attention span has decreased from 12 seconds to eight; less than that of a goldfish. 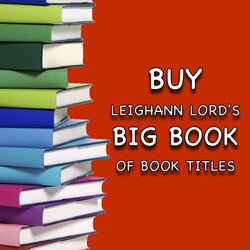 Leighann Lord’s Book of Book Titles let’s you make the most of those precious few seconds. 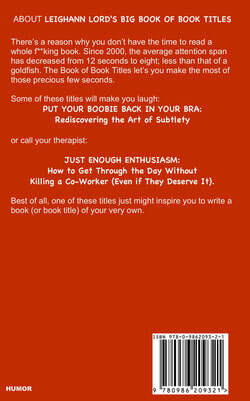 Some of these titles will make you laugh: Put Your Boobie Back In Your Bra: Rediscovering the Art of Subtlety; or call your therapist: Just Enough Enthusiasm: How to Get Through the Day Without Killing a Co-Worker (Even if They Deserve It). Best of all, one of these titles just might inspire you to write a book (or book title) of your very own. We are literary soul mates. You want to read a book but you don’t have time. I want to write a book but I don’t have time to do that either. Leighann Lord’s Big Book of Book Titles is perfect for both of us. I’ve collected these titles from the oddly shaped corners in my mind and from everyday conversations with family and friends. If my synapses are firing full-tilt I’ll even think of a subtitle. And that’s all she wrote. Literally. But in this 140-character, sound bite world, that’s all you need. Some of these titles will make you laugh, think, or maybe schedule an appointment with your therapist. Either way, I’m glad I could help, because that’s what soul mates do for each other. When Eat, Pray, Love Doesn't Quite Cut it! Okay, let's be honest here. ​This is purely a guilty pleasure bathroom read. Whether it's a quick visit or you plan to sit for a spell, Leighann Lord's Big Book of Books Titles is a fine companion and a wonderful addition to your bathroom bookshelf! 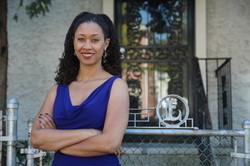 Leighann Lord is a stand-up comedian, author, and co-host of the Emmy-nominated StarTalk with Dr. Neil de Grasse Tyson. She has performed for U.S. troops in the Middle East and has appeared on HBO, Lifetime, Comedy Central, and The View. Leighann wrote for the pilot of The Chris Rock Show, is a contributor to the Huffington Post, and is the author of several books including Dict Jokes: Alternate Definitions for Words You’ve Probably Never Heard of But Will Definitely Never Forget, Volume One, which was nominated for a Wheatley Award. Dict Jokes, Volume Two, is also available on Amazon Kindle. For giggles she also penned Leighann Lord's Big Book of Book Titles: When You Don't Have Time to Read a Whole F**king Book. You might also enjoy her essay collections The Great Spanx Experiment, I Wish Facebook Had a Hate Button, and Happy Black Men. A workaholic-control freak-perfectionist, Leighann earned her Bachelor of Arts in Journalism and Creative Writing from Baruch College, City University of New York. While she owes no student loans, she is one of Visa's long-time indentured servants. Leighann is a New York City native, a queen from Queens, and a would-be member of the House of Ravenclaw.